Upright and motion MRIs test people's body structures under real world conditions. They are designed to recreate the body position that causes a patient's pain so the doctor can identify the source of the pain. Just about everyone has had to take a car, piece of electronics, or other item to be repaired. The seond question any mechanic or engineer always asks (after "What's wrong?") is, "When does the problem occur?" The easiest way for a mechanic to diagnose a problem is to recreate it. By hearing the squeaking noise for himself, rather than having you describe it, the mechanic can get at the problem much quicker. The same concept applies in medicine. Doctors always want to know when, why, and how you hurt. For most people with neck and back problems, they hurt after performing certain activities like lifting, bending, walking distances, or sitting for long periods. Rest usually makes it better. However, "taking a load off" makes it harder for a doctor to diagnose the problem. Unfortunately, standard MRI machines require patients to do just that: take a load off and lie down inside a machine for a while. When they're lying down, most patients aren't performing the weight-bearing activity that causes them pain, so it makes sense that they probably aren't getting the best diagnostic imaging. 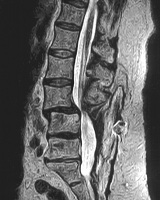 An example is the image on the right: the vertebrae of the spine are all aligned in this recumbent (lying down) MRI. Fortunately, there is a solution to this problem. New, "upright" MRI machines scan patients when they are standing, sitting, bending, etc. which allows the doctor to see what is going on when the patient is performing the activity that causes them pain. The results speak for themselves: the image on the right shows an image from the same patient in an upright MRI machine. In this image, the spinal bones are obviously misaligned. Standard MRI would have never been able to diagnose this problem, but upright MRI did. Upright MRI places patients in real world situations and provides real world results. There isn't yet an upright MRI center in Arkansas, but some of our clients have been pleased with results from providers in Dallas, Las Vegas, and New York. This is yet another example of innovative new medical techology providing the right tool for the job.